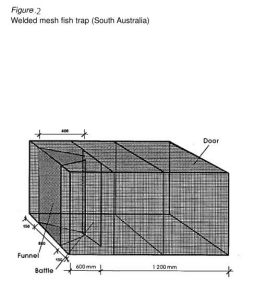 Rectangular traps vary greatly in size and construction material, but modern traps are usually made from steel rod or welded mesh. Because of their tendency to roll, they are used in areas where the current flow is not great. 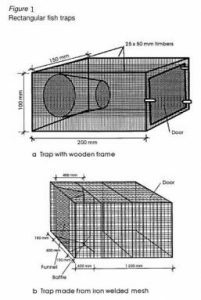 A rectangular trap often used in southern Australia is made from a single sheet of 50 x 50 mm welded mesh cut and bent into shape (Figure 2). The bait is tied or placed in a bait basket (or bait saver) in the centre of the trap. A baffle is often placed in front of the funnel to prevent fish from escaping back through it. A modified rectangular trap made from a sheet of 50 x 50mm welded steel mesh has been developed in Australia. This trap is 32 x 32 meshes (i.e. 1.6 x 1.6 mm) square, with rounded corners. The sides and funnel are bent from a piece 15 meshes deep. 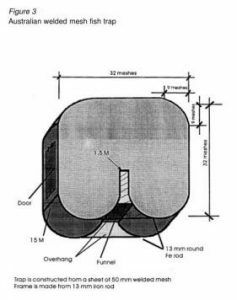 The mesh is supported by a frame made from 13 mm round steel bar (Figure 3).